The amplifier option adds ±10 V output level to existing arbitrary waveform generators. The additional card is available with 1, 2 or 4 channels. The amplifier modules are able to enhance the output levels of the existing arbitrary waveform generators of the 60xx and 61xx series from ±3 V to ±10 V. The amplifiers are available as 1, 2 or 4 channel version. Due to the high bandwidth of 30 MHz the options match all versions of the fast arbitrary waveform generators. The amplifier card is calibrated in factory together with the arbitrary waveform generator that it is used with. The calibration values are stored inside the arbitrary waveform generator card. 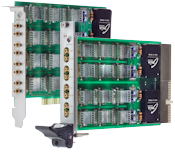 The amplifier option is available as short PCI Express (PCIe) card, as PCI card as well as 3U CompactPCI card. The analog ground of the amplifier card is completely isolated from the computers ground. Under normal circumstances and in usual computers this is the best solution to avoid unwanted ground loops. If for any reasons it appears to have problems like oscillation on the outputs, there is an additional "ground connect" jumper.